Flight from Reykjavik (Iceland’s domestic airport) or Copenhagen to Narsarsuaq. 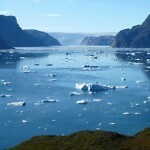 Reception in the airport and zodiac boat transfer through the Tunulliarfik Fjord, usually covered by icebergs, to Narsaq town. With about 1,500 inhabitants, Narsaq is the third most populated town in South Greenland. Time to stroll around the city. Overnight stay at the Kayak Hostel. We will set off for Qaleraliq camp, sailing through bredefiord usually filled with lot of icebergs and ice. 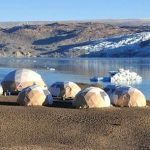 We will arrive to a cosy, enchanting camp set on a sandy beach, which contrasts with a spectacular view of two glacier fronts from Qaleraliq’s glacier. 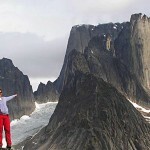 From there we will Ascent to the base of Tasersuatsiaq great lake and panoramic view of the Inlandice. Ascent by foot through a unique desert-like sand valley which will lead us to a surprisingly different landscape, that of the green and thick tundra. After passing the lake, we will climb up a mountain 400 metres high, from which we will have a mesmerising view of the lake, one of the largest in Southern Greenland. The summit is also a very special viewing point of the Inlandice, the immense inland glacier. From there you can gaze upon the infinite ice sheet up to the north coast of the island and towards the Arctic Ocean, and see the Nunataks, floating landmarks on the ice sheet. We may pick mushrooms and blueberries, and look for caribou, which are plentiful in the area. Accommodation in 4 bedded basic but comfortable rooms of Domo “loft”. Before touching the ice we will navigate along the vertical glacier fronts on a zodiac boat admiring the beauty of their vertical ice walls and numerous icebergs as we approach them along their more than 10 kilometres descent to the sea. From there and after a practical introduction to safety in the glacier, we will start the ice exploration. An impressive trek using crampons will be our introduction to one of the oldest masses of ice in the planet. We will explore its crevasses, drains, caves and seracs which give an incredible, labyrinthine quality to this glacier. We will pursue walk inside the ice cap towards the “nunataks” (floating landmarks on the ice sheet). Once in the moraine, walk up to explore a nunatak with amazing views from the top. Sleeping bag, personal equipment and some common equipment have to be portaged to the nunatak (approximate weight 12kg). Accommodation in tents at the Nunatak Camp. From the Nunatak we will start walking to the plateau, jumping over crevasses when needed, aiming for the snow area. Conditions are changing depending of the year, with presence of glacier rivers, lakes, slushy snow or just bare ice. Depending on many factors we will be able to see a hidden nunatak, impossible to see from any place in the coast. We will make camp over the ice, experiencing the vastness of one of the world last great unexplored places and with great views of the coast. The direction, length or route will depend on the current conditions as they change very much from one year to other. Tents, sleeping bags and food has to be transported into the ice (approximate weight between 12 and 15 kg). 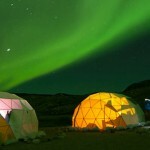 Night in tents in the ice cap. After the night on the ice, we will continue our exploration of the ice through different terrains, gradually descending towards the nunatak. Tents, sleeping bags and personal equipment has to be transported (6-8kg). Accommodation in tents at the Nunatak Camp. 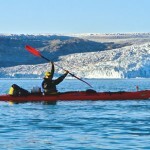 Gradual descent towards the coast where we will be picked up by a zodiac boat and be transported to Qaleraliq ice camp. After saying farewell to the ice cap, we will set off to Narsaq town among the huge icebergs falling off from the Eqaloruutsit glacier. Time to stroll around the city. We can visit the museum, the local handicraft workshop or the fish market among others. Dinner and accommodation at the Kayak Hostel in Narsaq. Boat transfer from Narsaq to Qassiarsuk, (former Brattahlid, capital of Viking Greenland). Walk through the village of about 50 inhabitants and guided tour of the viking ruins of Brattahlid, learning the history of the arrival of Eric the Red from Iceland at this small settlement in 985. Of particular interest are the reconstructions of a Viking house (spacious but cold) and an inuit dwelling (small but warmer), transporting us back in time to the harsh conditions in which these people lived and it definitely shows us how the Inuit knew how to adapt better to the progressive cooling of the climate. 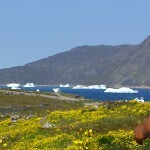 Hiking to Tasiusaq farms and optional kayak excursion in the “Iceberg Bay”, a 2 hour kayaking trip for beginners among icebergs in one of the safest and nicest spots in southern Greenland (70€ , minimum 2 participants). Transfer back to Qasiarsuk and farewell dinner with traditional Inuit dishes: fish, whale, seal, caribou, etc. Overnight stay at the Leif Eriksson Hostel. Transfer to Narsarsuaq. Time to walk around in the area and visit the local museum, the Bluie West One, former US militay base untouched since the Second World War. Flight from Narsarsuaq to Reykjavik (Iceland) or Copenhagen. – Lunch on departure day.